I got 2 eggplants in the CSA this week. I whipped up this little glaze and baked one of the eggplants for about 15 minutes. An easy and delicious appetizer or side dish! Depending on the size of the eggplant, you will have to adjust the measurements for the glaze. This made enough for one medium size regular eggplant. It would be great on a Japanese eggplant too! Preheat the oven to 350. Slice the eggplant as thinly as possible. Line a baking sheet with non-stick tin foil. Place the eggplant slices on the foil. Whisk together the miso and mirin. Liberally brush the glaze on the top side of the eggplant slices. Turn them over and brush more on the other side. Bake for 15 to 20 minutes or until the undersides get a little brown. 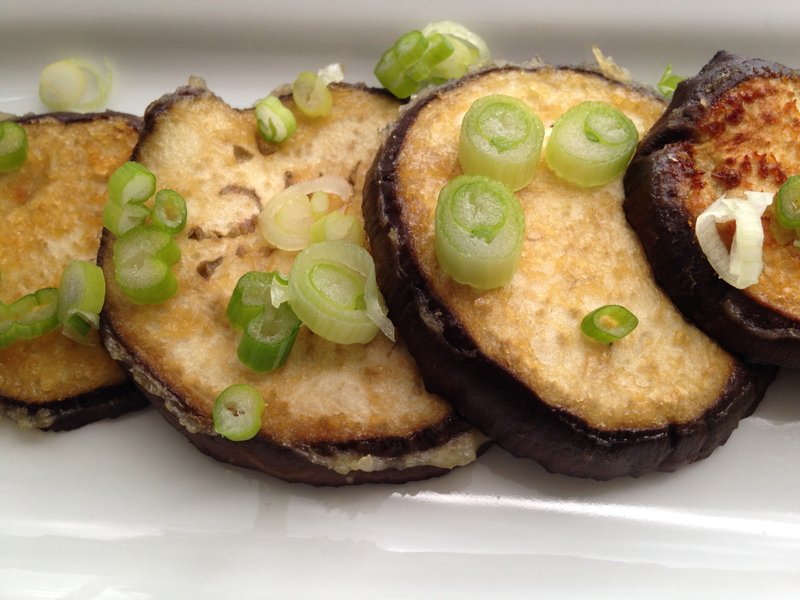 Slice a scallion for garnish and sprinkle over the miso glazed eggplant. Enjoy! thank you b! let me know how you like it!